However, depending on your system configuration, you may not experience the intended consequences of implementing DirectWrite. Some users have complained about blunt, blurry, ugly or unreadable font display, or uneven spacing between characters. 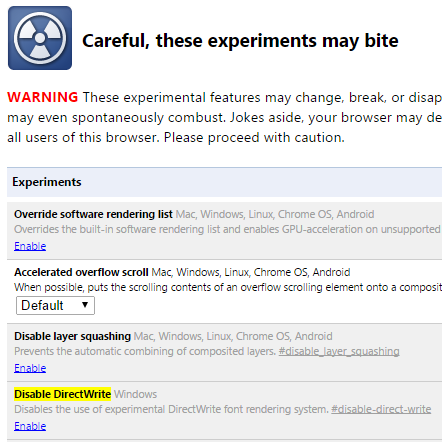 If you’re facing font rending issue after upgrading to Chrome 37 or newer version, you can try to disable DirectWrite support in Chrome. In Chrome address bar, type chrome://flags/ and hit Enter. Locate the title heading Disable DirectWrite. Click on the Enable link below it.